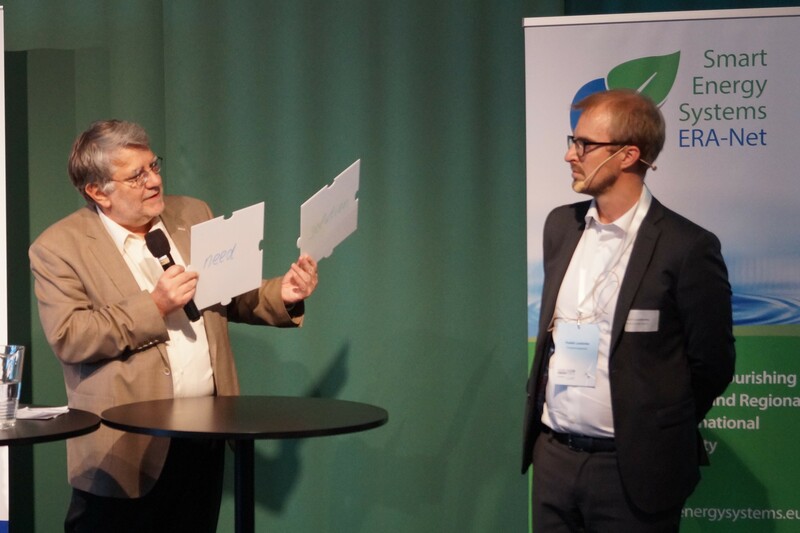 With a series of talks, discussions, co-creation and working group sessions at the Nordic Clean Energy Week in Malmö, ERA-Net SES set off to boost research for regional energy systems. From May 22 to 25, 2018, energy experts, researchers, existing and potential associated partners discussed and identified new fields of research activity. The officially launched new joint call for RDD projects on integrated energy systems will support innovative ideas with a funding budget of € 33.3 million. In a highly productive co-creation session, needs and potential solutions to efficiently provide and utilize high shares of renewables, up to and beyond 100% in the local or regional supply by 2030, have been identified. Among the ERA-Net SES Knowledge Community, projects insights were shared and key questions concerning regional matters have been elaborated. The panel "Speeding up for Change” at the Smart Grids Arena, hosted by ERA-Net SES in collaboration with "A challenge from Sweden”, addressed the pressing challenge of how the energy transition can be accelerated for aligning with the Paris climate goals. The importance of regional approaches and need-oriented research has been highlighted and approaches for motivating countries all over Europe have been proposed. The session was moderated by Ludwig Karg, ERA-Net SES Knowledge Community Manager. Christoph Frei, Secretary General and CEO of the World Energy Council, presented his view on the transition, digital revolution and new energy realities. Peter Droege, President of EUROSOLAR and Director of the Liechtenstein Institute for Strategic Development, emphasized the importance of fast decarbonization, the role of EUROSOLAR, and the ‘incumbent industry problem’. Political actions and focusing on key activities to start the energy transition are crucial, the expert pointed out. All identified needs of the Smart Grids Arena were visualised in a graphic which was afterwards handed over to the Ministry of Sweden as a policy message. Moreover, the outcomes of the parallel third National Stakeholder Coordination Group (NSCG) Meeting were presented in the afternoon panel of the Smart Grids Arena. The NSCG is a sounding board and exchange platform for smart energy systems and networks on the national level, enabling active contribution to the European SET-Plan Action 4 and its implementation. At the event, national R&I policy makers, R&I funding program managers, key research institutes, R&I platforms and experts from regulators exchanged experiences from RDI activities in member states and reflected on the ETIP activities from a national stakeholder´s perspective. The NSCG Meeting was supported by ERA-Net Smart Energy Systems and, in addition, facilitated by the European Commission and ETIP SNET. To leverage synergies and magnify impact, Associated Partner candidates for ERA-Net SES were invited to learn about the RDI initiative and their opportunities as Associated Partners. Participants seized the opportunity to present themselves and articulate the most urgent questions to be addressed by research on Smart Energy Systems, especially for the latest Call on Integrated Local and Regional Energy Systems. Amongst others, representatives from Regional and Business Development Agencies, Business Accelerators and Funding Programmes participated. In the afternoon, the new ERA-Net SES call focussing on integrated regional energy systems was officially launched by Michael Hübner (ERA-Net SES Coordinator) and Ludwig Karg (ERA-Net SES Knowledge Community Management). Afterwards, potential call applicants and Associated Partners engaged in a co-creation session with researchers from different European countries to match research needs and possible solutions that could be researched within new projects. Research needs and solutions were documented on puzzle pieces to map potential projects: Up to five pieces were connected to form need-solution clusters and potential consortia for new RDI projects started to form. We are looking forward to see the puzzle clusters grow during following events, developing into fruitful project applications! As ERA-Net SES is diving into regional development topics with its new focus initiative RegSys (Integrated Regional Energy Systems), the Knowledge Community is incorporating this subject as well. The five different working groups (System Architecture and Implementation Modelling, Interoperability and Standardisation, Consumer and Citizen Involvement, Storage and Cross Energy Carrier Synergies, Regulatory and Market Development) identified topics at the crossroads of their focus areas and regional aspects. In a plenary discussion, some of these topics were identified as cross-cutting or beyond the scope of the existing working groups, inspiring the idea to create a new working group on regional matters. The previous outcomes of the working groups, namely the Spotlights (highlighting key scientific findings) and Policy Briefs (recommendations for policy makers) were presented. Projects of the first call of the ERA-Net SES focus initiative Smart Grids Plus, which started in 2016, are close to finalizing. In this Knowledge Community meeting, they shared their key scientific insights and related policy recommendations. These results were discussed and supplemented with comments of fellow experts, forming the basis for a new edition of Spotlights and Policy Briefs. Energetic discussions between external experts and researchers from funded projects filled the breaks of this ERA-Net SES Knowledge Community face to face meeting. During these four days of learning, discussing and co-creating with our stakeholders, ERA-Net SES has successfully progressed into the matters of regional energy systems. We highly appreciate the valuable contributions of all present experts from diverse areas and are looking forward to continue leveraging expertise mutually – for flourishing innovation from local and regional trials towards a transnational knowledge community!